"The language is developing faster than our progress." Vertical Entertainment has debuted another new official trailer for Farhad Safinia's film The Professor and the Madman, which will actually be getting a release in theaters this May. 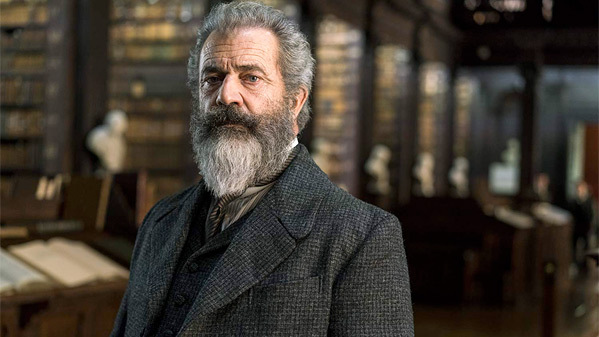 In the film, Mel Gibson stars as James Murray, a professor at Oxford who is hired to work on compiling the very first edition of the Oxford English Dictionary. During the course of his fastidious work, he receives over 10,000 entries from a patient and convincted murderer at the Broadmoor Criminal Lunatic Asylum, a man known as Dr. William Chester Minor, played by Sean Penn. The cast also includes Steve Coogan, Eddie Marsan, Natalie Dormer, Jennifer Ehle, Ioan Gruffudd, Jeremy Irvine, Aidan McArdle, Brendan Patricks, and Adam Fergus. Not that sure this will be worth seeing. You can watch the other official trailer for Safinia's The Professor and the Madman here, for more footage. Professor James Murray (Mel Gibson) begins work compiling words for the first edition of the Oxford English Dictionary in the mid 19th century, and receives over 10,000 entries from a patient at Broadmoor Criminal Lunatic Asylum, Dr. William Minor (Sean Penn). The Professor and the Madman is directed by Iranian filmmaker Farhad Safinia, making his feature directorial debut after a short film previously; he also wrote the screenplay for Apocalypto and created the TV series "Boss". The screenplay is written by John Boorman, Todd Komarnicki, and Farhad Safinia; based on the book by Simon Winchester. Produced by Nicolas Chartier, Bruce Davey, Mel Gibson, and Gastón Pavlovich; co-produced by Léonard Glowinski and Macdara Kelleher. The film opens first in Europe throughout April & May. Vertical Entertainment will release Safinia's The Professor and the Madman in select theaters starting May 10th coming up. Anyone?